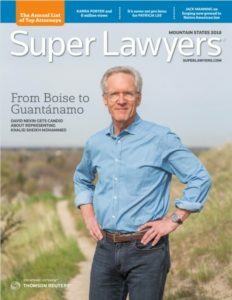 David Nevin featured on the cover of 2018 Super Lawyers magazine. Read the cover story: From Boise to Guantanamo. Idaho man serving life sentence for first degree murder is freed, gets retrial. David Nevin discusses his experiences with the US Military Commissions at Guantanamo Bay on 60 Minutes and Idaho Public Television. 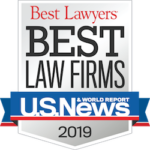 Mr. Nevin also is interviewed about this work in Spotlight: David Nevin Lawyers are Heroes. Recent US Supreme Court case provides hope to Idaho teens sentenced to life in prison. Idaho Supreme Court affirms $3.8 million dollar jury verdict in liposuction death. David Nevin described as “Velvet Shiv” for his work in defending the accused. Concern for officer safety did not justify police officer’s actions in this instance. Pretrial of the Century, the September 11 Case at Guantanamo Bay. Federal court orders release or retrial of Idaho man convicted of first degree murder and sentenced to life after prosecution failed to disclose material evidence.